We hate to bring it up, but it’s getting to be that season again. For log home owners who are venturing into a more rural setting, snow removal becomes a new responsibility. Even if you’re not halfway up the side of a mountain, it’s a good idea to take stock of what options are out there to move and remove the snow from your driveways and roadways. For simplicity, we focused on snowplows, snow blowers and some new human-powered options. For the latest on snowplows we spoke to Mark Klossner, Marketing Director for Boss Plow, based in Iron Mountain, Mich. Privately-owned and founded in 1985, Boss Plow offer both commercial and residential plow applications and are considered to be the largest brand of plows in the US. Though many of their plows are configured for plowing operations using trucks, Boss has seen tremendous growth in plows they have developed for utility terrain vehicles (UTVs). These are the side-by-side four wheelers that seem to be overtaking four-wheel ATVS in popularity. Their nimbleness and lower cost make them highly attractive to many homeowners and small ranchers. Boss offers a number of straight blade options for these UTVs, and for anyone who might have a forest trail or fence line they need to keep clear these powerful vehicles may be just the ticket. Check out the video here. 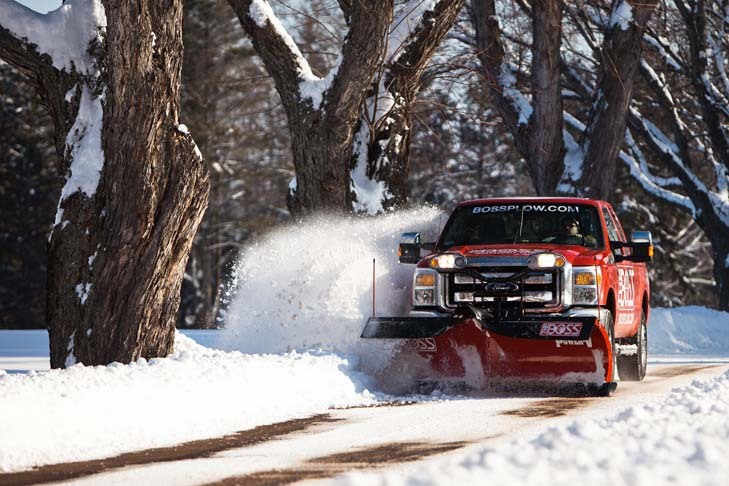 However, many homeowners opt for the addition of a snowplow to their half-ton or larger pick-up truck. If this is the route your plan to take, Klossner recommends that you take a tour of their website’s Plow Selector Tool to match the right type of plow to the vehicle to which you plan to attach the plow. Most trucks now can be purchased with a plow-ready package that puts a control wiring box right in the cab of the truck to enable easy operation. These plow packages can be retro-fitted onto older models, but you’ll want to make sure that the frame of the truck can handle the weight power load of a plow before buying. “Some of these SUVs that are marketed as trucks do not have the proper frame to handle snow plows,” Klossner said. “Most half-ton trucks like F-150s or GM 1500s are able to handle snow plows, but some with crew cabs and other car-like features are built on non-truck frames and can’t handle the extra strain.” Klossner suggests that you give them a call to review truck and plow options before making the truck purchase to avoid investing in a truck that can’t handle the job. As to learning how to handle a plow—both V-shaped and straight-bladed—Boss has a complete YouTube channel that offers tutorials on how to handle snow plowing in many situations (just click on the website’s YouTube icon to access these tutorials). Boss Plows V-plows can be configured as an arrow-shaped V to clear snow on either side of the travel path, or into a reversed cup-like V to collect and move yards of snow into designated areas. The videos offer hours of tutorials for the novice plow operator on techniques for snow management. 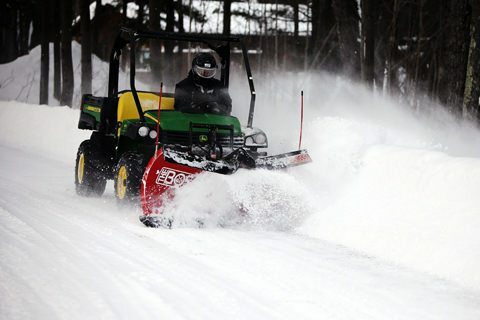 When considering snow blowers, it’s important to assess your winter weather, as well as what surface you’re clearing (driveways, walks, or decks). The price ranges vary dramatically; some snow blowers can run up to $1,500 with all the whistles and bells. Some features to test before you buy include: ease of maneuvering the blower, powered versus manual, gas engine versus electric. If a dusting every once in a while is what you’ll be clearing, a lightweight electric model may be just fine. However, if you’re experiencing heavier snowfall, a high-powered gasoline engine is probably the way to go. One clever option that really can make a difference is an electric starter, which removes the challenging pull cord starter from the picture. For a more detailed overview, check out this Consumer Reports article. You know you’re in snow country if your neighbor has one of these in the garage! The roof rake is a lightweight, aluminum tool roughly shaped like a scraper attached to a long flexible handle that is used to clear snow from the roof and prevent ice dam buildup. Ice dams can cause considerable damage when water backs up and drains under the shingles and into your home. Note: Roof rakes have a general length of 15-20 feet long, and are best employed by homeowners when the roof is accessible from the ground. 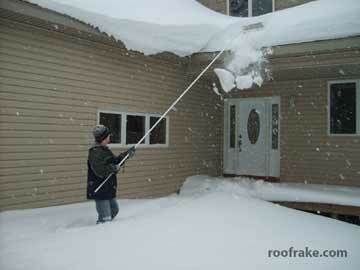 A steady platform like staging is the best way to operate a roof rake on higher elevations. If your roof is particularly elevated from the ground or steeply pitched, it’s recommended to call in a professional to clear snow from the roof. For some of the roof rake options available, check out this website. 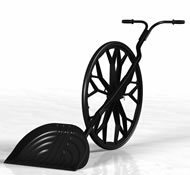 One interesting environmentally friendly alternative we found for gas- or electric-powered snow removal was the ingenious Sno Wovel, which uses the operator’s leverage and a large wheel to enable easy snow removal. Despite its less-than-elegant name, the Sno Wovel is sturdily constructed from steel tubing and a lightweight polycarbonate shovel blade. It’s also relatively inexpensive ($139 plus shipping) when compared to even a modest snow blower. A study by the University of Massachusetts also found it less physically challenging than regular snow shoveling, with no back strain and an exertion level comparable to normal walking. A final word of advice: don’t wait until the first storm to buy your snow equipment! Your selection will be much more limited and you may end up with a less than optimal piece of equipment for your specific needs.